Meagan is a Toronto-born but NYC-based traveling fashion illustrator with an inspirational blog TravelWriteDraw where she sketches her colorful journey with sparkling personality and amazing talent. I have known Meagan for quite a while through her beautiful work and blog, but that was the first time we actually met in person. You know that feeling when you imagine somebody before you meet them and, to your surprise, the person turns out to be totally different than your vision of them? This wasn’t the case! Meagan’s personality emerged as sweet and heartwarming, and this is exactly how I imagined her to be. Everybody who came to Rebecca Minkoff’s store that day had a chance to get their portrait drawn by Meagan. It was an amazing experience to watch her working and see how the illustration comes to light. Meagan uses a combination of gouche, acrylic and pencil in rainbow hues and her work always comes out with a splash of colors. I was watching how, starting with the contour of the face, with careful but confident strokes, a graceful silhouette surfaced from under the Meagan’s brush in no more than 15 mins. How remarkable! Curious to see Meagan in action? Watch this video below, straight from the Love Is In The Air party. You can see Meagan’s last illustrated adventure with Condé Nast Traveler here and for more of her fabulous work visit her blog TravelWriteDraw. These are more photos from the Love Is In The Air event. And, if you’re still looking for a gift for your Valentine, stop by Rebecca Minkoff’s store in Soho or visit the website. 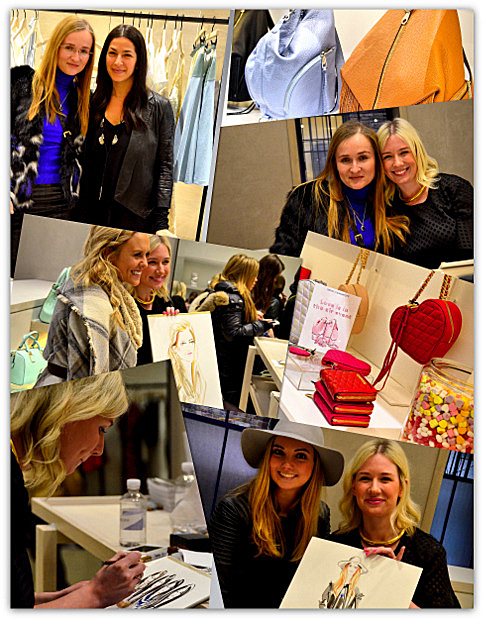 Many thanks to Rebecca Minkoff and Meagan Morrison for this exciting event! Her bags are soooooo chic and stylish!!! Loveeee! Looks like fun. Thanks for sharing.